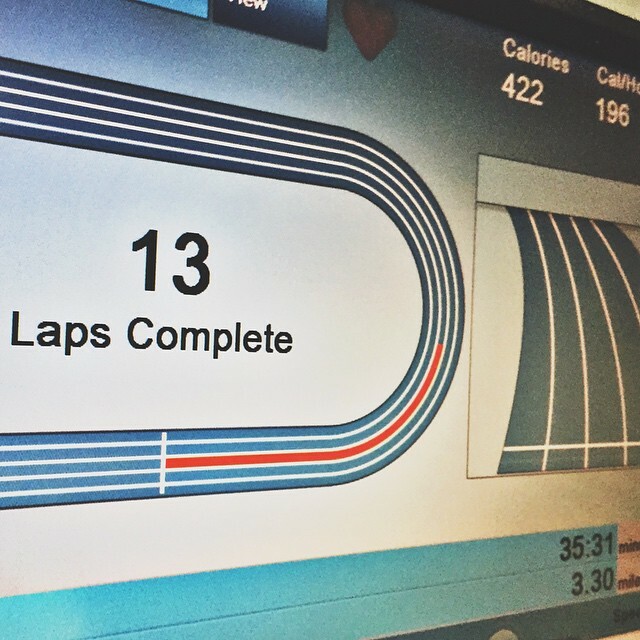 Geeky Running News: A treadmill that follows your pace, instead of the other way around. I saw an article today on New York magazine’s Science of Us column about a treadmill that is being developed that matches your pace. It sounds pretty cool. A device is positioned behind the runner, which can tell how close you are to the front of the treadmill. If you are close to the front, it speeds you up. If you are lagging behind, it slows you down. This helps to create the natural pace variance that you get when running outdoors. 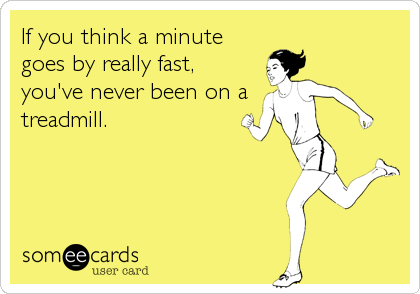 I think it would be cool because, as I’ve said before, I don’t know how to tell improvement when doing speed work on a treadmill. 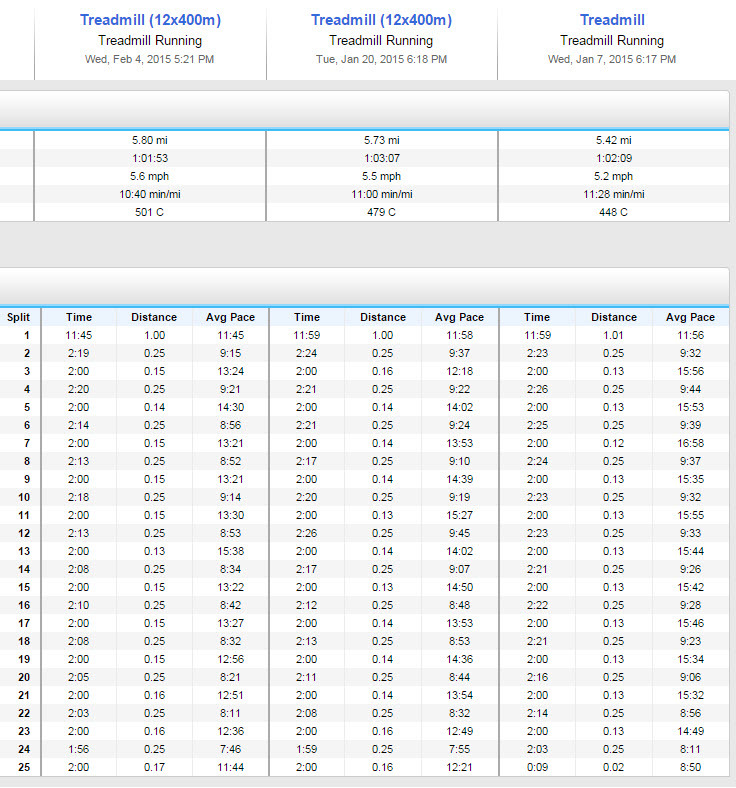 Since the treadmill is in charge of what pace I’m running, I never know if I’m actually running at my full potential. However, if I could speed myself up by picking up the pace, which would move me closer to the front of the treadmill, which would trigger the belt to move faster, I think that would be a better indicator than me just deciding what speed I want to run at, pressing a button, and going. Anyone else thinks this sounds pretty cool for those necessary evil treadmill runs? Start at an easy pace for you. For me, this was 5.0 (12:00 min/mi). At a predetermined time or distance, increase the speed by 0.1. I increased by 0.1 every 0.2 miles for the first mile, and every 0.25 for the next two miles. I planned to do 3.3 miles total, so for the final 0.3 miles, I increased the speed every 0.1 miles. This gave me a final speed of 6.8 (8:49 min/mi) and an overall average pace of about 10:30. Warm up at an easy pace for 3-5 minutes, then alternate sprinting (I used speeds between 7.0 and 8.0, starting slower and increasing speed as the intervals went on and my legs warmed up) for one minute with walking (I walked at 3.5) for 1.5 minutes. Repeat six times. Then alternate sprinting for 1.5 minutes with walking for 2 minutes. Repeat six times. Cool down. I decided to do a workout consisting of a quarter mile at 5.0 (easy pace), quarter mile at 6.0 (around current 5k pace), quarter mile at 7.0 (the speed work), and a final quarter at 5.0, repeated three times for a total of three miles. I also did a final quarter mile where I started at 7.0 for a minute and then progressively lowered my speed to ease into a cool down period. I added lines as mile markers, so you can see where the next set started. My average pace was around 10:15 min/mi, which is the first time I’ve seen an average starting with a 10 since April, and the first I’ve seen below 10:20 since March. Yay, my knee issues didn’t completely break me! I ran the 5k distance in around 31:44, or just 20 seconds shy of the 5k I ran in March. The second fastest 5k distance I’ve ran! I plan on taking it easy on my Wednesday run to rest up for Friday. I don’t plan on trying to break that 30 minute barrier just yet, but I’m still going to give it my all!